where the αi’s are weights and the gi’s are (possibly non-linear) functions with go to collect all possible interactions. A serious drawback occurs because of the arbitrary way these weights and functions are defined. For, the socioeconomic factors (Xi, I = 1,…,p), their weights (αi, I = 1,…,p) and the specific functional forms (linear, non linear, increasing, decreasing) of the gi’s, are often selected to reflect the analyst philosophies and not by scientific criteria. This is often why, and based on the same data, conflicting results are obtained by analysts that hold conflicting political philosophies (and Cuba is a blatant example). In addition to the above described human bias, there are several, non trivial statistical design problems that also affect the analyses. For, a country’s population is heterogeneous and its subpopulations are affected differently by different socioeconomic policies. Therefore, by analyzing the effects of selected variables in specific subpopulations that are particularly affected by them (say health care advances in historically marginalized minority groups or censorship techniques in intellectual milieus), the analyst can distortion the comparison results. For example, one would be forced to trade-off given percentages of decrease in rural infant mortality vis-a-vis a decrease in freedom of speech, locomotion and thought among the intellectuals and middle classes. To circumvent bias in variable and weigh selection of the dimension reduction process, some analysts have suggested using index numbers. For example, one could use the Consumer Price Index (Connover and Inman, 1982) to compare two nations. But this would imply accepting as the standard the free-enterprise, consumer-oriented philosophy. Any other weighting system (index) would, in the same manner, imply spousing some other economic philosophy. Such choice biases the process of comparing nations with different socioeconomic systems. In addition, indices such as Paasche, Laspeyres, etc., which are based on market consumption and price fluctuations, are worthless in countries (say, like Cuba) where both, prices and (rationed) consumption, are strictly regulated by the government and the black market cannot be monitored. To make things worse, there are important data collection problems that arise when analyzing and comparing socioeconomic data from different countries. Some problems found by this researcher, when using the U.N. Yearbooks and Cuban Censuses as sources include: (i) different definitions for the same variables (does secondary education include normal or vocational schools? ); (ii) different units (gross national product, given in domestic currencies); (iii) different time periods (results given per year vs. per five years); (iv) overlapping periods (data collected from January to January vs. from June to June); (v) vanishing/appearing series (cost of living indices); (vi) changing bases (index numbers); (vii) changing definitions within a series (the value of the monetary unit in which (say exports) are reported, fluctuates from year to year); and (viii) biased, incomplete or revised data, are just a few problems. Finally, there are important effects from certain concomitant variables that are commonly left out of the analysis of socioeconomic data. And these can seriously affect the problem at hand. They include: (i) the status of any pre-existing infrastructure (for it is not the same to increase literacy by 20 % when the starting level was 10 %, than when it was 75 %); (ii)the (S-curve) growth effect (for there is a steeper rate of growth in the middle of any process, when conditions have been established and needs have been discovered, than at its start or end); (iii) the saturation effect (for there are just so much, say miles of road that should be constructed); and (iv) policy trade-offs to be made (20 kilometers more of roads vs. a day care center) in the face of contention for limited resources. Precisely due to all the above problems, statistics can contribute greatly to the socioeconomic analysis methodology in at least three different ways. First, by raising awareness among both, analysts and the public, to the complexities in such types of comparisons. Then, by providing a scientific framework (statistical thinking and philosophy) where such analyses may be performed in a more unbiased fashion. Finally, by incorporating three of the best statistical tools: (i) case/control methodology, (ii) longitudinal studies and (iii) the use of (historical information as) concomitant variables. In the present paper we introduce methodology for socioeconomic data analysis that addresses the above discussed concerns and problems. We do so via the examination of a specific example: that of Cuba. We claim that our analysis methodology is of general use and may be easily adapted to other cases. And in order to apply it to the Cuban case, we next give some necessary background information. Throughout the last 36 years, the Cuban government and many of its sympathizers have (and this has also been singled out before, e.g. Eberstadt (1986) and Díaz-Briquets (1986)) actively portrayed a pre-1959 Cuba far worse than it actually was. As a result, the undeniable (differential) increments that (say in education and health) Cuba has achieved, have been unduly magnified, in a similar way as it occurs when a bar chart is sliced or the scatter plot’s axes are distorted. Such misuse of statistics is not exclusive of governments nor of politics, but does lie at the core of the socioeconomic comparison problem. For example, the Cuban government statistics always ignore how, in the 1953 census (taken only five years before Castro came to power) there were almost 6000 physicians in Cuba (a ratio of one physician for every 1000 inhabitants). And how nation-wide and inexpensive medical cooperatives (models for current American HMO’s) covered a big segment of the Cuban population. Both of these indicators were (at the time and even today) among the highest in Latin America, with Chile, Uruguay and Argentina. Also, how Cuban industrial output in 1953-1957 grew 24 %, or 4.8 % annually (Mesa-Lago 1981, p. 57). In 1951-1958 there was a surplus trade balance of 420 million dollars (p. 63). And the housing gap was being reduced, in the period of 1945-57 at a rate of 7 % annually (p.70). Another example is provided in Castro’s 1953 speech “La Historia me Absolverá.” There, Castro stated that there were 700,000 unemployed in Cuba, when the 1953 Census gave only 173,811 unemployed and a total of 266,572, at all other levels of underemployment. Also, the Cuban government reminds us that the 1961 literacy campaign taught “one million Cubans” to read and write. But it does not say that there were over four million adults already literate, nor that Cuba’s literacy rate was 73 %, among the highest in Latin America at the time. Also, comparisons are taken out of context. For example, current Cuban achievements in health and education are either compared with levels of 36 years ago or with poorly chosen countries (controls) such as Guatemala or Nicaragua. Finally, growth rates of the variables under comparison are seldom analyzed. We aim to show (i) that pre-Castro’s Cuba was hardly the backward country some like to imagine -but one that had laid the socioeconomic infrastructure for Cuba’s current achievements. (ii) That the “differential increment” (used in this paper as the difference between the levels attained by Cuba and other comparable sister countries in Latin America) in health and education, are not as wide as they are usually assessed. For, these last 30 years have been of large socioeconomic development everywhere, particularly in Latin America. (iii) We will establish some of these “differential increments” by comparing Cuban growth rates with those of the other three control countries. (iv) We will discuss the social costs incurred in obtaining these differential increments and show how they are higher than usually depicted. Finally, (v) in the process of establishing the above objectives, we will demonstrate our methodology of analysis. We will compare socioeconomic data from two, adjacent, 30-year periods (before and during Castro) obtained from Cuba and from three other countries used as “controls”. In the next section we first compare and discuss data from the 1930’s to the 1950’s, then overview some of Cuba’s political, economic and social problems in the 1959-1990 period and compare Cuba’s growth rate with that of the other three countries (controls), during this latter period. Finally we summarize our results and give some general conclusions. We now present socioeconomic data from Cuba (used as case) and three other comparison countries (used as controls): Chile, Costa Rica used as and Mexico. These four Latin American countries have a common historical, economic and social background. Chile is by far the closest match. Even though it is larger in territory, Chile has vast, thinly inhabited (desert and frigid) regions. Its population is comparable to that of pre/post revolutionary Cuba, as is the racial composition. Chile’s levels of education and other socioeconomic variables are also close. Mexico is larger, while Costa Rica is smaller, than Cuba in area and population. But the Mexican economic system has some similarities with that of postrevolutionary Cuba. And both colonial histories have many common points (it is said that Spain trained its Mexican Viceroys as Cuban Governor Generals). And Costa Rica, even though it is smaller than Cuba in size and population, has also attained high socioeconomic standards. Mexico had for many years a state-oriented economy and quite singular political party system. Costa Rica, in turn, has had a longstanding pluralistic one. And Chile has experimented, both, pluralistic and authoritarian regimes in the recent past. Cuba has had a hard line Marxist dictatorship and a complete state-oriented economy for the past thirty six years (political systems determine the socioeconomic development). sion about the reasons for the selection of these specific countries to be used as comparison controls, of these socioeconomic indicators as variables and of this case/control methodology, can be found in Romeu (1993 and 1994). This paper continues the research started there and in Romeu et al. (1992). In Table 1, we present data from The Statesman Yearbook (1929). 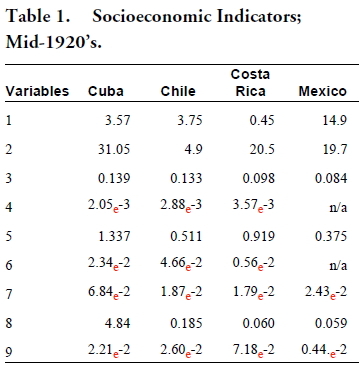 The selected variables provide a snapshot of several economic, political and social conditions in these four countries, during the mid 1920’s. These variables are: total population (1), in millions; and population density (2), per square kilometer; primary students (3), teachers (4); and cattle (5), in per capita; miles of paved roads (6), rail roads (7), and telegraphs (8), per square km. ; and number of post offices (9), also per capita. Notice the large similarities between Chile and Cuba. Mexico and Costa Rica are, in this epoch, further behind in socioeconomic development. They will be used to compare development growth level at later dates. In particular, notice how Chile and Cuba, with similar population sizes, also had similar coefficients for primary teachers and students and for post offices. These signal out similar levels of education and social interaction. A snapshot description as that of Table 1 is insufficient to characterize a socioeconomic process. We need the time series development data for the case (Cuba), as well as for the controls (Chile, Costa Rica and Mexico). This is shown in Table 2, taken at three times: circa 1938, 1948 and 1958, respectively. The variables selected are: population density (1); infant mortality (2); energy (3); primary students (4) per capita; and number of radio receivers (5) per thousand inhabitants. They reflect health, education and nutrition conditions, and are taken from the corresponding U.N. Yearbooks. Notice, for example, how Mexico doubled its population in the 30 years elapsed, while the other three increased it only by half. On the other hand, Cuba halved its infant mortality rate, from a 1938 level comparable to that of 1th958 for the three controls (showing how Cuba was historically ahead of most Latin American countries in health care). In levels of energy, pre-revolutionary Cuba came from behind with respect to both, Mexico and Chile, and surpassed them by almost tripling its energy consumption in these 30 years. In (primary) education Mexico made the most significant gains while the others remained at constant levels (Cuba lagging somewhat behind). In number of radios (which reflect consumerism as well as level of information and standard of living) Cuba was by far the country with the highest levels. Finally, it is worth noticing how, in 1950, the illiteracy rates were: Costa Rica (20.6 %); Chile (19.8%); Cuba (22.1 %) and Mexico (43.2 %). We now analyze and compare Cuban data before and after 1959. They illustrate some often overlooked social costs associated with the implementation of the current Cuban socioeconomic model. Results from the 1953, 1971 and 1980 censuses yield that there were, respectively, 8.8 %, 87 % and 93 % of government employees in the work force. Private workers reported in 1962 were 740,000 but only 175,000 in 1978 (while the population grew from 6 to 8 million (M) inhabitants). In the area of housing, the 1980 Census reports that 21 % of the units that existed in that year were built between 1946 and 1958 (when population was 6 M). It also reports that 22 % of the units were built in a comparable period of 1959 to 1970 (when technology was far more advanced and population was 8 M). In the 1953 Census, there were 1.2 M. housing units for 5.9 M people. In the 1980 census there were 2.3 M units reported for 9.7 M people. The growth in housing units has not kept pace with population growth; the housing problem remains on top of Cuba’s priority list as attested by the fact that the “extended” family nucleus, defined in the 1980 census as “couples with their children and other relatives” (in-laws, grand children, cousins, nephews, grand parents) constituted 32.5 % of the units. During this period, private construction was banned and only the government built new housing units. The 1953 Census reports 72 % of whites, 11 % black and 15 % mixed race. In 1980 the corresponding census results are 66 %, 12 % and 21 %. In the realm of public education, in 1953 there were 73 % of 14 year old or above who could read and write. This figure went up to about 95 % after massive literacy campaigns in the early 60’s. The University of Havana (the largest of pre-revolutionary Cuba’s three public universities) had 25,000 students and 2,500 professors in 1956; it decreased to 20,500 students and 1990 professors in 1962 (and lower yet in 1965) due to massive, politically-motivated, faculty and student purges in the early 1960’s (e.g. this researcher was expelled from the University of Havana in 1965, along with hundreds of others, and then sent for two years to the UMAP Labor Camps, with thousands of others). After 1970 large increases in an extremely docile student population have been achieved (e.g. 256 thousand, third cycle students in 1986). In the editorial field, for example, over ten thousand titles were published between 1975 and 1985. But, of these, only 7 dealt with religion or theology, in a country that, in 1956, had 80 % selfavowed Catholics and 8 % Protestants (Romeu et al, 1992). Internal migration is constrained because the government controls both housing and ration cards. The 1980 Census reports a general growth, among the 14 provincial capitals, of 17 % (the smallest of which is Matanzas with 14.5 %). However, Havana shows only 7.7 % growth, half as much as that of any other large city. Emigration is also severely controlled by the government. In spite of this, 10 % of Cuba’s population has gone into exile since 1960. Most recently, over 120,000 left during the 1980 Mariel Boatlift and 35,000 during the 1994 Raft Exodus. Among these exiles there are tens of thousands of university professionals, administrators and technicians, forever lost to contributing toward Cuba’s advance. Finally, tens of thousands of Cuban men and women have been incarcerated and several thousand have been executed by the government or have perished trying to leave Cuba in rafts. They suffered such fate as a result of the Castro regime’s ban on (i) peaceful political activism, (ii) free enterprise, and (iii) free emigration. On the other hand, in the area of health care (Alonso and Lago, 1994) Cuba went from a life expectancy of 64 years (1960) to 74.2 (1984); from an infant mortality rate of 34.7 per 1000 (1959) to 10.2 (1992); from 0.93 physicians (1959) to 4.33 (1992); from 0.74 nurses (1959) to 6.83 (1992); from 4.22 hospital beds (1959) to 6.1 (1992), all per 1000 inhabitants. All private health cooperatives and clinics were taken over by the state and half of the 1959 health professionals went into exile. Finally (Excelsior, 1994), the Cuban Gross Internal Product per capita has continually declined (after having increased steadily from 1980 to 1986). Recent figures show these decrease as: 1,116 (1988) to 1050 (1989), to 1000 (1990), and to 879 (1991) M pesos. However, these statistics cannot be assessed in isolation. In the next section they are compared with similar ones obtained from the three controls, during these same years. Most indicators for the 1928-1958 period show how Cuba was a rapidly developing nation. For example, standard of living and health indicators such as cars, radios, TV, roads and life expectancy, were going up, while negative indicators such as infant mortality were going down. In addition, Cuban indicators were significantly better than those of the three other comparison or control countries. It could be reasonably be expected that such situation would continue under any other government. And it would be interesting to compare Cuban long term forecasts based on the 30-year period growth of 1928-1958, with the Cuban achievements of the 1990’s. The difference between the two results could be attributed to the effects of the Marxist Cuban regime on Cuba’s socioeconomic development. However, this is a highly controversial approach and we will not pursue it further. Instead, we will use the levels of the three above selected comparison countries, used as controls, whose 1928-1958 growth rates were at par or below those of Cuba, for the same period. And we will use them to assess the present Cuban achievements with what they could presumably have been, using the old development model. The difference would, then, provide the differential increments we are looking for. Therefore, paralleling the above section, we present (in Table 3) a longitudinal study and (in Table 4) a final snapshot of the socioeconomic conditions of the four countries under comparison. 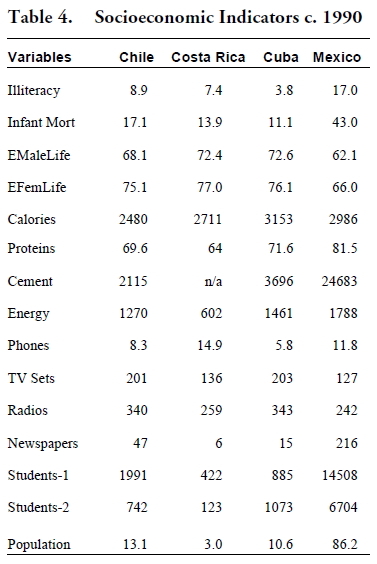 In Table 3 we present population density (1); infant mortality (2); female life expectancy (3); energy consumption (4) and primary students (5) per capita, and radio receivers, per thousands. They are taken at several points in time in the past twenty years. In Table 3, we see how Cuba and Chile have contained their population growth, an indicator of social advance, as opposed to Mexico (who has only slowed it). Next, we see how Chile and Costa Rica have gone from a level of infant mortality much higher than Cuba, to one comparable to it. Mexico still laggs behind in this indicator, having also made big advances. In life expectancy, however, all three control countries have attained much larger levels, particularly Costa Rica has matched those of Cuba. These two health indicators signal out how there have also been strong improvements throughout Latin America. Also, they show how these other countries have achieved a larger growth rate. It is then possible to conjecture whether Cuba’s large advances in health care would have been obtained anyway, especially when Cuba already had, in the mid 1950’s, high health standards and a long health care tradition. In energy consumption (indicator of industrial development and of standard of living) Costa Rica has maintained a growth level similar to that of Cuba. Mexico has had a larger growth rate, but it is known how Mexico has had an industrial awakening in the last fifteen years. Chile has had a smaller growth rate than Cuba. Primary students have decreased as a percentage of the general population. But this has been a world phenomenon as a whole. Higher and technical education continue to be Cuba’s showcase. But the three controls are rapidly closing the gap. Finally, number of radio receivers is similar in Cuba and Chile. Costa Rica and Mexico are lagging behind, but have made big increases (having started from lower levels). Table 3 allows us to compare, not only the level attained by each country, but also its growth rate. Mexico is still the one with the highest population growth and lower socioeconomic indices, among these four. But the gap (from 1930) has shrunk. Chile, Costa Rica and Cuba, starting from different levels (Cuba generally ahead), have practically closed the gap. 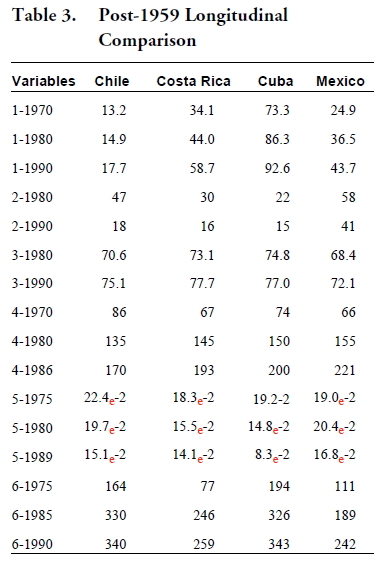 Table 4 shows the 1990 (U.N. Yearbook) statistics on selected socioeconomic variables. Notice how close indicators from Cuba, Chile and Costa Rica now are. Mexico has closed the gap, too. This shows that significant socioeconomic advances have been achieved by all countries in the entire region, during the last thirty years, independent of the type of socioeconomic system that prevails in each country. From Table 4 we notice how Chile and Costa Rica have also reduced their illiteracy rate to single digits. Mexico has reduced it from 44 % to 17 %, which denotes a significant effort. With regard to intake of calories and proteins (nutrition indicators) Cuba is still about 10 % above the three comparison or control countries in the former and about the same in the latter. However (Gordon 1983) the high standards of nutrition of pre-revolutionary Cuba are well known, so this is no surprise: Cuba had an original head start. In energy consumption, basis of an industrial policy, Cuba fares between Mexico and Chile (Costa Rica, mainly agricultural and rural, sags way behind). Finally in consumer indicators (phones, TV, radios). Cuban levels of yester years have been surpassed or attained by the control countries. Given Cuba’s higher levels in the 1950’s, we conclude that a higher growth rate was achieved by the three control nations, with regards to standards of living. Tables 1 and 2 show how Cuba was, before 1959, a rapidly (but unevenly) developing country. Especially so in the areas of health, education and individual consumption. Cuba’s main problem during the 1950’s was, precisely, how to extend these rapid development gains to all social/geographical sections of the country. Table 3 shows how the past 30 years have been ones of intense development, not only in Cuba but in all Latin America. And how the three countries selected as control have also grown, from levels usually below those of Cuba, to levels either close to that of Cuba or higher. The differential increments, or differences between these levels, can then be estimated from Table 4. 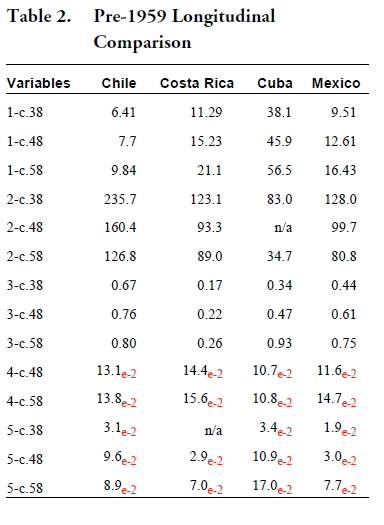 For example, we now calculate the differential increment with respect to Costa Rica, for the variable infant mortality. This differential is of 2.8 (per 000’s). And with respect to illiteracy, it is of 3.6 %. These values are obtained assuming that Cuba would have attained, at least, the illiteracy rate of Costa Rica (7.4%) under the pre-revolutionary model, instead of its own 3.8 %. This premise is based on the fact that, with the previous model, Cuba was always at par or above Costa Rica in educational indicators. Therefore, any difference between the two may be attributed to the effect of the current Cuban socioeconomic development model and would constitute an estimate of the differential for the variable eradication of illiteracy. All other differentials are obtained in a similar way. Another approach to obtaining estimates of the differential increments of a given variable, consists of using the growth rates of the three control countries and applying them to the Cuban data, for forecasting. Then, the difference between the levels forecasted in this way and the actual Cuban levels would provide an estimate of such differential. 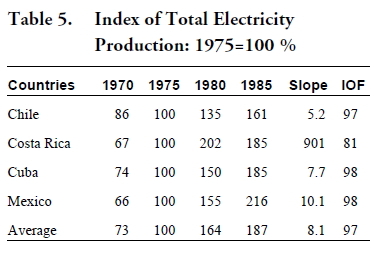 For illustration, we present, in Table 5, the indices of total production of electricity for 1970-1986, taken from the Statistical Abstract of Latin America. The year 1975 corresponds to 100 %. We have included the slope and Index of Fit (IOF) of a simple linear regression obtained from these data. First, they were obtained separately for each country and then for the combined three controls. The average values per year are also given. The combined regression corresponds to all of the (3×4=12) control countries’ data points. We take the slope from the combined regression (8.1) as the estimate of the general group growth in the variable electric energy. We then compare it with the (growth) slope for Cuba alone (7.7). Using the slope of the combined data, for the Cuban electric growth data, one can obtain a higher index for the 1985 index of production of electricity. However, notice that a confidence interval for the combined slope will include the individual Cuba slope. Therefore, we can say that the Cuban growth in production of electricity, during this time, in not significantly different than the growth of the combined three control countries, none of which has followed the Cuban socioeconomic development model. Even more, if we take Chile out of this comparison, Cuba’s growth would be significantly smaller. This supports our statement that growth, in general, has been such that other countries with different socioeconomic systems have caught up with Cuba’s rates of growth. This result questions the statements of some, in the sense that the only way to obtain Cuba’s achievements in health and education was through the pains suffered during the revolution. At present, this research is at the stage of obtaining such differential increment estimates for a number of variables from the data base. Toward this and other related objectives, a proposal to NEH has been written and submitted and is pending evaluation. Finally, some social costs of implementing the Post 1959 Cuban socioeconomic model have also been discussed. Whether the differential increments obtained by Cuba, in health care and education, justify or not such costs depends on each analyst’s philosophy and ideology. Statistics does its job by signaling out this crucial fact in an unambiguous way. Alonso, J. F. and A. Lago. “A First Approximation Design of the Social Safety Net of a Democratic Cuba.” Cuba in Transition Volume 4 (Washington, 1994). Connover, W. and R. Inman. Introduction to Business Statistics. Wiley, 1982. Cuban Census of 1953, 1971 and 1980. Díaz-Briquets, S. “How to Figure Out Cuba: Development Ideology and Mortality.” Caribbean Review (Spring 1986). Eberstadt, N. “Literacy and Health: The Cuban Model.” Caribbean Review, Vol. 5 (Spring 1986}. Excelsior Newspaper (Mexico City). May 6, 1994; Economic Section. Gordon, A. “The Nutriture of Cubans: Historical Perspective and Nutritional Analysis.” Cuban Studies/Estudios Cubanos, Vol. 13, No. 2 (Summer 1983). Mesa-Lago, C. Cuba in the 1970’s. University of New Mexico Press, 1987. Mesa-Lago, C. The Economy of Socialist Cuba: A Two-Decade Appraisal. University of New Mexico Press, 1981. Mesa-Lago, C., ed. Revolutionary Change in Cuba. University of Pittsburgh Press. 1971. Romeu, J. L., Samuelson, D. and H. Spirer, “An Assessment of the Human Rights Situation in Cuba.”” Proceedings of the 1992 Social Statistics (ASA). Romeu, J. L. “Statistical Thinking Can Enhance Cuban Human Rights Assessments.” Proceedings of the 1993 Social Statistics (ASA). Romeu, J. L. “A Statistical Comparison of Cuban Socioeconomic Development.” Proceedings of the 1994 Social Statistics (ASA). Statistical Abstract of Latin America. Vol. 28. U.N. Yearbook. Vols. 1948 to 1993.